Bring a large pot of water to a boil. Add the broccoli florets and blanch for 1 minute, or until bright green and just barely tender. Remove from the pot, leaving the blanching water behind, and lay out in a single layer on a clean towel to dry. Set aside. Return the water to a boil. Add the noodles and cook until just tender, 3-5 minutes. Drain the noodles, then rinse them gently under cold running water until the water runs clear. Pat or shake the noodles dry, and set aside. In a large mixing bowl, whisk together peanut butter, rice vinegar, sesame oil, soy sauce, brown sugar, and ginger. 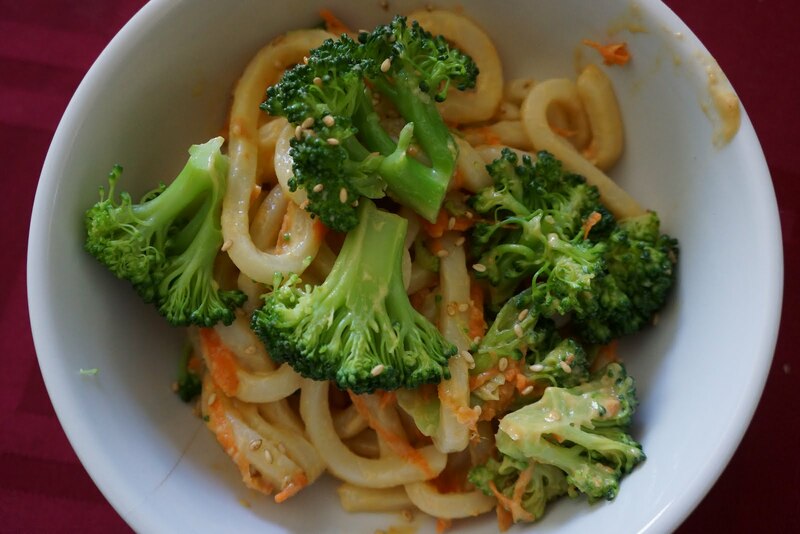 Add broccoli, noodles, carrots and scallions, and toss to coat everything with the dressing. Taste and adjust the salt as needed (you probably won’t need any, since the peanut butter and soy sauce are already plenty salty). Sprinkle with toasted sesame seeds, and serve at room temperature. Leftovers are also great cold, straight from the fridge.